Crested Gecko and Gargoyle Gecko ~A Comprehensive Care Guide. The care requirements for Crested Geckos (Correlophus ciliates) and the Gargoyle Gecko (Rhacodactylus auriculatus) are very similar. We have combined their care guides and will highlight anything that differs between the species for specific aspects of care. Despite the similarities of care and the environment these geckos are kept in, it is important to point out these two species should not be housed together in the same enclosure. The Crested Gecko originates from the Southern islands of New Caledonia off the coast of Australia. It was first discovered in 1866 but by the 20th Century it was declared extinct. It was rediscovered in 1994 following a severe tropical storm. It has since been extensively bred in captivity and has become one of the most commonly kept species of reptile. This is a fantastic achievement for this wonderful species as the status of their wild cousins is considered vulnerable. The Crested Gecko is now being considered for CITES listing. As an occupant of ‘Rain Forest’, they are another casualty of deforestation and habitat destruction. CITES inclusion will have no impact on the captive bred population of Crested Geckos but will hopefully ensure their wild cousins will not once again be declared extinct. 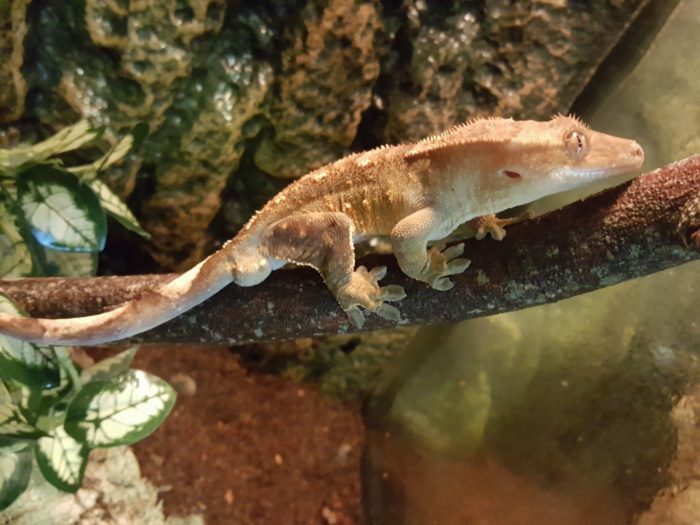 Crested Geckos, often referred to as ‘Cresties’, are an adorable species, one favored by the newest to the most experienced of reptile keepers. They have big eyes, above which are hair like projections (cilia), resembling eyelashes. It has a crest running from each eye to the tail. When you hold a ‘Crestie’ it has a soft velvety feel. It is available in a wide range of colours and patterns. These amazing geckos can cling to virtually any surface because their toes and the tip of their tail are covered in thousands of microscopic hairs called ‘setae’. These hairs exploit ‘van der Waals force’ to allow the gecko to move just about anywhere on its sticky foot adventures. The Gargoyle Gecko was discovered in 1869. It is found on the Southern end of the island of New Caledonia. It has bumps resembling ears and prominences on its head that lead to its name Rhacodactylus auriculatus. (Auriculatus, Latin, referring to ears or eared.) Often referred to as ‘Gargs’, these are another wonderful species of gecko to own. They have similar sticky foot abilities to the Crested Gecko. In the wild they live in scrub and rain forest. In captivity they have done very well kept in conditions very similar to the crested gecko. Gargoyle Geckos are available in various shades and with some degree of varied coloured markings. The remainder of this guide will refer to Crested Geckos but unless we state differently the guide applies equally to Gargoyle Geckos. The Crested Gecko is generally regarded as being nocturnal; however it is more accurate to consider it a crepuscular species, most active at dawn and dusk. It is an arboreal gecko, living in the trees of ‘rain forest’. It is omnivorous and feeds on both insects and fruit. The Crested Gecko generally tolerates handling quite well. They do appear to like to jump and climb when opportunity provides during handling. They often have a very friendly temperament and will sometimes take fruit mix from the fingers. They are not renowned for being biters; in fact they are one of the gentlest reptiles you could own. Crested Geckos are tiny as hatchlings, weighing only 3 or 4 gms. Being rather slow growers, they are often still very small when offered for sale. An adult Crested Gecko reaches a snout to vent length of around 12 cm, 21cm snout to tail tip. The Gargoyle is very similar in its requirements as to the Crested Gecko. Some Gargoyle Geckos prefer a diet with higher insect content than that of Crested Gecko. Size between the two species is comparable. The Gargoyle Gecko is also quite easy in regards to handling but it is not generally as calm as a Crested Geckos. Both species have the ability to drop their tail when threatened. The dropped tail will wriggle for a few minutes and hopefully distract a predator while the tailless gecko makes its escape. The Crested Gecko cannot regenerate its tail. In fact when discovered it was thought to be a tailless species. None of the specimens captured in the wild had tails! Once captive breeding was established it was soon revealed that these geckos do start life with a tail. Crested Geckos without tails are often affectionately referred to as ‘frog bums’. Tail drop in captivity is far less common. Rough handling, trauma and fighting with enclosure mates can however result in tail drop. This also applies to Gargoyle Geckos. However a Gargoyle Gecko can regenerate its tail. Both species are oviparous, or ‘egg layers’. The ‘Crested Gecko’ also has a very rare ability; it is a ‘parthanogenic’ species. This ability allows a female Crested Gecko who may never have encountered a male to reproduce. This is widely used by some of the species sharing this ability but it is a very rare occurrence in Crested Geckos. However it is possible for a single female Crested Gecko, one that has not been in contact with a male, to produce fertile eggs. The hatchling will be a ‘clone’ of its mother and the hatchling will be female. This is a rare occurrence so please don’t worry if you are thinking of buying your first Crested Gecko. The chances of this happening with your Crested Gecko are very slim. We hope the guide that follows helps if you should choose to add a Crested or Gargoyle Gecko to your reptile collection. We love keeping both of these species. They are a joy to own, full of character and when the lights go down very active. The more scientific would argue against this, but we see personalities in our ‘Cresties and Gargs’. There again we see personalities in all of our animals, they are to us before anything else very loved and treasured pets. As with all our species specific care guides, we have based the information that follows around the ‘Five Needs’ outlined in the Animal Welfare Act(2006). Your Crested Gecko will require an appropriately sized enclosure that must be escape proof for both occupant and any live food offered, and it must prevent ingress of other animals such as curious family cats. Both Crested and Gargoyle Geckos are arboreal species and will need branches and surfaces to climb, thus the enclosure should be vertically orientated. In the wild their environment is warm and humid and these conditions need replicating in captivity. Wooden vivarium’s can be used for Crested Geckos but it is essential that the wood is correctly sealed including all seams, otherwise within a very short space of time it will begin to warp and rot. We prefer to house Crested Geckos in specialist enclosures such as the glass Exo Terra range. These can be purchased for a reasonable price. They have the advantage of hinged doors, the depth to allow a good layer of substrate, the height suitable for arboreal species with excellent ventilation. They are of course waterproof and if looked after will last for many years. Some keepers have made fantastic Crested Gecko enclosures using appropriately sized ‘Really Useful Boxes’ resting on their ends. This is not a practice we would adopt for permanent enclosures at Grinning Gecko but adapted and used correctly, they can create a suitable habitat for quite a long period. Enclosure Size. Crested Geckos are often purchased as small hatchlings. They are tiny when they emerge from their egg and a rather slow growing species. A hatchling between 6 and 10gms can be housed in a suitable furnished plastic faunarium. Dimensions approximately 20cm x 10cm x 20cm. However, providing you offer lots of hiding spots you can usually accommodate your hatchling in the more permanent setup described below. Once your Crested Gecko reaches 10 gms in weight it can be moved into a 30cm x 30cm x 45cm Exo Terra (or similar) enclosure. It is possible to accommodate two or three geckos of the same size in the enclosure providing it is adequately furnished. (The issue of cohabiting Cresties is discussed further down the guide). Once your Crested Gecko attains a weight of 25gms it is time to consider moving up to a larger enclosure, one that will suffice when it reaches full adult size and weight. Up to three adult Crested Geckos can be housed in a 45cm x 45cm x 60cm Exo Terra (or similar) enclosure. Bigger IS Better. 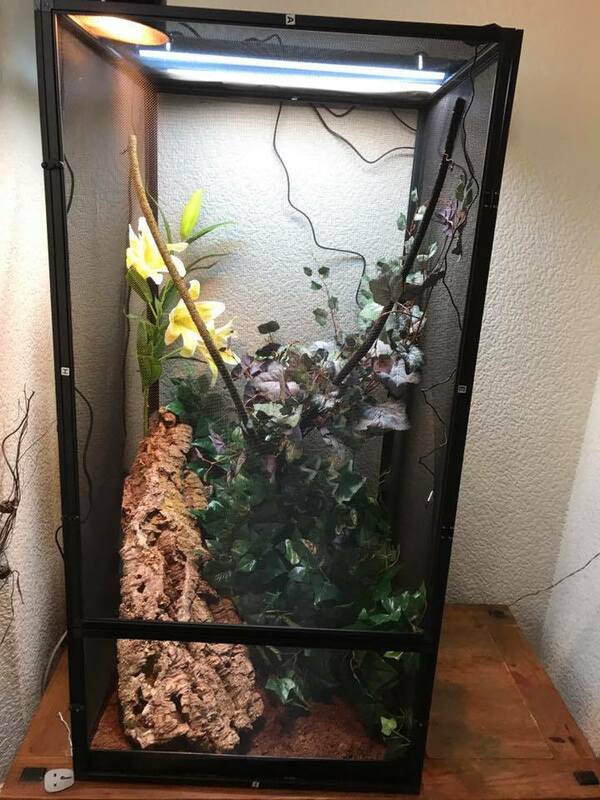 We house a trio of Crested Geckos in a massive 90 cm x 45 cm x 90 cm tall Exo Terra enclosure. This is extremely spacious for a trio of Cresties but we can say with total honesty that not a bit of space is wasted. The geckos utilise every bit of the enclosure in their night time antics and it is a delight to be able to watch them leap and climb around their home. If you truly want to observe the natural behaviour of this species, for adults – ‘the bigger the enclosure the better’ Heating. Crested Geckos are, like all other species of reptile, ‘ectotherms’. They cannot generate their own body heat but rely on external temperatures to provide the optimal temperature for digestion and enzyme activity. They require a thermal gradient that allows them to warm up and cool down as their needs demand. It was thought for some time that Crested Geckos do not require any supplementary heating to an enclosure situated in room maintained at a comfortable average room temperature. It is now becoming more widely accepted that Crested Geckos benefit from a spot in their enclosure that is slightly warmer than the rest. This can easily be achieved with either a compact UVB (discussed under lighting) or a low wattage sunlight bulb. These should be on for 12 hours a day in summer and 10 hours per day in winter. If your home is on the cool side at night, or if you wish to observe your geckos night time antics, a similar sized moonlight bulb will generate a little warmth. A 15 watt bulb on a 30x30x45cm or a 25watt on a 45x45x60 cm Exo terra enclosure, placed in a canopy or dome on top of the mesh, creates just enough heat to give the occupant a warm spot without causing any significant effect on the ambient temperature for the rest of the enclosure. That is dependent of course on the room where the enclosure is located being at a comfortable average temperature. This is the only method of heating an enclosure we would ever recommend without the control of a thermostat. Despite operating at a maximum, these bulbs do not generate enough heat to overheat the enclosure. In fact they will have very little influence on the enclosure temperatures other than close to the canopy beneath the bulb. It does however provide some degree of thermal gradient within the enclosure. It is VITAL that you monitor enclosure temperatures with an accurate digital thermometer. Overheating kills Crested Geckos. Below are the temperature ranges generally recommended for Crested Geckos. Sadly a number of Crested Geckos are lost each year due to overheating in the summer months. Please keep extra close eyes for the temperatures rising too high in your Crested Gecko enclosure during hot weather. It is also important to ensure your enclosure is not situated in direct sunlight. Glass vivarium’s can easily turn into extremely hot greenhouses if left in direct sunlight. The temperatures achieved being far beyond those that a Crestie can survive. Crested and Gargoyle Gecko enclosure temps during the day should be between 72 f and 80 f. At night the temperature can be allowed to go as low as 55 f to 60 f.
Lighting. Provision of lighting for your Crested Gecko is, as described above, serves dual purpose. It can be the heat source as well as the light source to create optimal conditions for your gecko. It was assumed for many years that being nocturnal; ‘Cresties’ did not need any UVB lighting supplement. However it is now becoming widely accepted that they are more accurately described as being crepuscular. They are most active at dusk and dawn. It is likely that they receive some low level UVB during these periods. It is also not unusual to see a Crested Gecko sleeping under dappled cover, again a situation where they may receive a low level of UVB exposure. There is no doubt that Crested Geckos have been kept successfully without UVB exposure. This is largely down to the excellent nutrition they receive. The most popular Crested Gecko diets provide enough D3 to maintain the gecko’s calcium metabolism. It is now becoming established that Crested Geckos can benefit from UVB exposure. We use compact UVB bulbs in Exo Terra canopies for our Crested Gecko enclosures. The smaller enclosures are equipped with a 2% bulb and the larger a 5% bulb. What does UVB lighting actually do for the gecko? When we place a reptile in an enclosure it is deprived of the beneficial rays of sunlight. Even in a sunny room, there are no beneficial rays reaching the gecko as they are blocked out by glass. Reptiles need good levels of Vitamin D3 for their calcium metabolism. Without D3 they cannot absorb calcium effectively, their bones weaken and bend, joints become effected making it painful for the gecko to move and serious health problems begin. Correct diet and vitamin /mineral supplementation will provide enough vitamin D3 to keep the gecko’s calcium metabolism ‘ticking over’. However vitamin D3 can be toxic so supplements etc. do not offer the gecko the maximum levels of D3. If the gecko can utilise UVB it will synthesise more Vitamin D3 until optimal rather than maintenance levels are achieved. Once optimal levels are reached, they synthesis of D3 stops, even if the gecko sits fully exposed to UVB.This is explained more fully in our ‘Guide to Common Health Problems’. We have also noted that when exposed to UVB, activity levels and appetites increased and colouration of our geckos became brighter. If you can offer your Crested or Gargoyle Gecko UVB lighting, please do so. You will without any doubt be giving it a much better environment in which to live. It is of course vital that the enclosure is furnished appropriately to provide areas of shade and dappled shade thus creating a ‘photo gradient’. (See Décor) Substrate: Substrate is the material used to line the bottom of the enclosure. For hatchlings we use kitchen roll. However once we are convinced that they are eating adequately we switch to eco earth or plantation soil. Crested Geckos require a humid environment. Products such as eco earth retain moisture well following enclosure spraying. This helps to create the humid environment your gecko requires. Ideally your substrate needs to be on top of a drainage layer otherwise you risk it becoming waterlogged and stagnant. Crested & Gargoyle Gecko enclosures, especially the Exo Terra glass vivarium’s , are perfect for creating a stunning bio active environment, complete with live plants and mosses. Even if you do not set up a ‘Bio Active’ enclosure, the guide to providing a drainage layer will help ensure you create conditions that are right for your Crestie. Enclosure Furnishings. You will need small dishes in which to place your Crested Geckos food. For a hatchling, something as small as a milk bottle top will suffice. One of the common concerns raised by new owners of very small Crested Geckos is their extremely small appetite. They can take their fill from a blob of gecko diet in the milk bottle top without leaving a trace of them feeding. (You know your ‘Crestie’ is eating when you see poops.) Even a full size adult doesn’t require anything larger than a 2oz sauce pot for a food dish. You can buy ledges that attach to the glass sides of the enclosure. Some of these, along with a surface for the gecko to rest on, have recesses for small food or water dishes. Water dishes can be of similar small size. Crested Geckos rarely drink from a bowl, preferring to drink droplets following spraying. Plus of course, there is a fluid element to their diet. Décor. The décor within the enclosure is an extremely important aspect of your Crested Geckos care and its environment. As an arboreal species, these geckos require branches and vines to climb. Branches should provide horizontal as well as vertically orientated resting places for your gecko. We also like to include large pieces of cork bark or cork tubes within our Crested Gecko enclosures. These provide hides, surfaces to climb on, to rest on or in and they hold in moisture helping to retain humidity within the enclosure. Damp cork tubes towards the bottom of the enclosure also provide areas of cool for your geckos. The branches and cork bark should enable the gecko to sit at various heights within the enclosure. If a low output heat source is used, as above, then a good thermal gradient will be created in the enclosure. Plants and foliage can be used to turn your Crested Gecko enclosure into a stunning display. However enclosure décor has far more importance than aesthetics. Plants can be real, silk or plastic. Please see our ‘Bio Active’ page for information regarding the use of live plants in your enclosure. (Not all plants are safe for geckos.) For now we will refer to plants as being silk or plastic. The use of plants attached to the top and trailing down the side of the enclosure provides excellent hiding places for your Crested Gecko. They appear to love sleeping, stuck to the glass, covered in foliage. You can use the foliage to create areas of deep and dappled shade within the enclosure. A photo gradient that becomes essential if UVB lighting is used. Artificial bromeliads can be used to decorate the bottom of the tank. They can provide climbing surfaces and places to drink droplets of water. The plants and foliage can create the security and environmental conditions your geckos need. Their inclusion should be considered a major part of your geckos care but an aspect of care that can be visually appealing to you. I’m sure you will find designing and setting up your enclosure an enjoyable experience. It will become an ongoing job though. You will always be looking for that little extra tweak to make it just that bit better. That especially applies if you house your Crested Gecko in a ‘Bio Active’ setup. There you are not maintaining an enclosure but a complete albeit miniature eco system. An important warning about imported silk vines. Like many keepers, we are always looking out for products to enhance our enclosures. This sometimes includes looking for bargain price items. I ordered a selection of silk vines via EBay from a company in China. After I had set up a new enclosure and just as I was about to turn on the heat source I had a thought. I took a sample of the vine outside and put a match to it. Within a few seconds I had a vine of fire. It may cost a little bit more to furnish your enclosures with branded reptile décor but safety has to be priority. If you do buy unbranded products for use in your enclosure please ensure they aren’t a fire risk or toxic. It’s better to be safe than sorry Enclosure Maintenance. For hatchlings, kitchen roll should be spot cleaned or changed daily. If the enclosure has an eco-earth or similar substrate, daily removal of poop or uneaten food will suffice. Glass can be cleaned with a reptile safe disinfectant such as F10. Plastic and silk plants can be cleaned on a regular basis using reptile safe disinfectant or ‘Milton Solution’. They should be thoroughly rinsed after disinfection. The eco earth substrate will probably need a partial exchange every four to six weeks. Need for a Suitable Diet. Both Crested and Gargoyle Geckos are omnivores. They eat a diet of fruit and insects. In the captive environment most keepers feed their ‘Cresties’ a powder based diet that meets all of the geckos nutritional needs including vitamins and minerals. These diets are usually referred to as either ‘Complete Gecko Diet’ (CGD) or Meal Replacement Powder (MRP). We highly recommend both the Repashy and the Pangea range of Crested Gecko Diet. These are available from many reptile shops or direct from their official UK distributors ‘on line’. These scientifically balanced products ensure your gecko receives the correct nutritional balance including all of its vitamins and minerals. The powder, often fruit based, is mixed with a small amount of water to make a smooth paste which is then offered to the gecko in a small dish. Some geckos prefer the mixture thicker than others. A little bit of trial and error is in order until you get the mix perfect for your gecko. This is the staple diet used by most keepers for their Crested & Gargoyle. It is of course nice to give your gecko variety and treats. Don’t throw that over ripe fruit away. ‘Cresties’ love over ripe fruit. Pears, Mango, Peaches and Watermelon can be ‘mushed’ up to create a delicious treat for your gecko. Some keepers will also mix ‘mushed’ fruit 50/50 with meal replacement powder. These mixes should only be offered as treats and variety, not as their regular diet. Over ripe Banana can be offered to your ‘Crestie’ as a very occasional treat. Its high potassium levels and its calcium binding effect make it unsuitable for regular feeding. Do NOT feed your gecko any form of citrus fruit or avocado. These can make your gecko very ill or even prove to be fatal. Fruit based baby food was at one time a popular food for ‘Cresties’ but it really is totally unsuitable diet. Please don’t be tempted to offer it to your gecko. The commercially available reptile ‘Jelly Pots’ have no nutritional value. They are rich in e numbers and additives and lack any substantive nutrients. They are not good for your gecko and in our opinion a complete waste of money. Crested Geckos and Gargoyle Geckos also eat ‘bugs’,or more accurately some will. Crickets, roaches and locusts are the most commonly used feeder insects. These should be gut loaded and lightly dusted with a combined vitamin and mineral supplement. We highly recommend Repashy Calcium plus for dusting of all ‘live food’. Please see our ‘Live Food Guide’ for details of how to gut load your ‘bug’. Waxworms can be offered to your Crestie as a treat. Most reptiles find waxworms irresistible and can almost become ‘hooked on them’ refusing all other food in favour of them. Please offer them very sparingly. Live food can be offered weekly, more frequently for hatchlings and juveniles. Only feed enough for your gecko to eat in one sitting and if possible remove any uneaten live food the following day. Do not worry if your Crested or Gargoyle Gecko shows no interest in live food, many wont. They can live purely on the high quality CGD or MRP products. Water is of course essential for your Crested Gecko. Although we place a 2oz water dish in our ‘Crestie’ enclosures I have yet to see them drink from it. They do of course meet some of their fluid requirement from the water content of their food. Your geckos will drink droplets of water from the foliage and furnishings in your enclosure following spraying. We give our enclosures a light spray in the morning and a slightly more heavy spray in the evening. We increase the frequency of spraying during the warmer months or any ‘heatwave’. Spraying provides the fluid and humidity your geckos require and it also helps prevent overheating. Need to be able to express normal behaviour. By providing a suitable environment we create conditions where our gecko can display normal behaviour patterns. For instance, the provision of the gentle thermal gradient allows your ‘Crestie’ to display normal ectothermic behaviour. By providing the appropriate lighting you let your ‘Crestie’ exhibit crepuscular or nocturnal behaviour. Most aspects of care for your gecko will in some way contribute towards your gecko being able to express normal behaviour. The more research you carry out about your gecko, the more you will be able to identify ways in which you can allow your ‘Crestie’ to express normal behaviour. Need to be housed with or apart from other animals. As already stated, despite their similar care requirements, Crested and Gargoyle geckos should not be housed together. They will fight and serious injury will occur. If you house a male and female together of either species you will inevitably get breeding activity. Males reach sexual maturity earlier than females. They will often harass a female for mating before she is ready. Premature breeding can place a heavy toll on the female. It is of course essential that the geckos are separated if there is any sign or indication of bullying or aggression. It is advisable to keep an emergency temporary enclosure available for any occasion where the geckos need separating. Something like a large tall faunarium would suffice. This could also be put to good use with the occupants of a conflict free enclosure. It will be ideal for accommodating your geckos during major enclosure maintenance. The above also applies to Gargoyle Geckos. However Gargoyle Geckos do have a reputation for being a little more aggressive to each other than ‘Cresties’. Keep a very close eye for hints of conflict. It is important to point out that a gecko or reptile of ANY species should not be introduced directly into the established territory of an enclosure occupied by another. This would be seen as intrusion rather than a ‘new friend’. The enclosure needs a complete strip down, sterilisation and refurbishment to render it a new ‘neutral’ environment for both geckos. It is also important to ensure enclosure mates are of similar size and weight. Under NO circumstances should two males of either species be housed together. They WILL fight and inflict serious injury and potentially death on each other. Often when keepers acquire their Crested or Gargoyle Gecko they are too small and too young to be accurately sexed. If you are raising young geckos you should keep a close eye on them for any signs of male characteristics. The shots below show the difference between male and female Crested Geckos. Need to be protected from pain,suffering, injury and disease. This need should be apparent to ALL keepers. If your gecko is sick or injured it obviously needs help. Our ‘Guide to Common Reptile Health Problems’ covers many of the more minor health problems your gecko may face. For serious illness or injury, if your gecko is collapsed,bleeding or in obvious pain and distress, you need to get it to a vet. Specific to Crested Geckos, one problem often raised by new keepers is their ‘Crestie’ being unable to stick. Usually this is a minor problem with an easy solution. Perhaps there is something on the glass preventing the gecko from sticking. A rinse with clean water and a wipe should correct that. If the gecko is very close to a shed it can lose some of its sticky foot abilities. The most common reason for ‘my Crestie doesn’t stick’ is that the gecko has paddled through its ‘mush’. If they get CGD mix on their feet it can make it difficult for them to stick. A bit of warm water and a foot clean normally fixes the problem. A more significant problem specific to Crested and Gargoyle Geckos is heat collapse. As already stated in the ‘Need for a suitable environment’, these geckos cannot tolerate temperatures being too high. They overheat quickly. If you find your gecko in a state of collapse, or spot it gaping and gasping for air or showing twitching or abnormal behaviour ‘Check your Temperatures’. Glass enclosures can very quickly become an overheated greenhouse. If your gecko is suffering from overheating it is vital that you cool its enclosure down and in doing so cool your gecko down. Spraying of the enclosure and a cooling fan can swiftly bring temperatures back to an acceptable level. Sadly every summer we hear of casualties and fatalities, on occasions whole collections of ‘Cresties’ being lost because of the room they were in becoming so badly over heated. If your gecko does not quickly respond to cooling strategies you need veterinary help. If you have followed good practice in setting up and maintaining your gecko’s environment, if you give it the appropriate level of care and attention you will have gone a long way towards ensuring it lives a life free from pain, suffering, injury and disease. Despite our best efforts though, things can go wrong and your gecko need help. Please don’t delay in seeking advice or in the emergency situation contacting your vet. We hope you found our ‘Comprehensive Guide for Crested and Gargoyle Geckos’ of value. If there is anything we have not covered or anything you wish to get more information about please feel free to email. If you spot any significant errors or strongly disagree with any of the content of our guides we would welcome hearing from you. We are not ‘the perfect, most knowledgeable or most experienced’ keepers. We offer guides that work for our animals. It is always wise to read a variety of care guides and to speak to as many keepers of the species as you can. Thank you for reading our ‘Comprehensive Crested and Gargoyle Care Guide’. Whether you choose a ‘Crestie’ or ‘Garg’ you will be owning and caring for a fascinating gecko who we hope brings you many years of joy. We absolutely love our ‘Cresties and Gargs’ and Im sure you will love yours.